With an average time spent in the Octagon at less than two rounds per fight, don't blink when Volkan Oezdemir and Anthony Smith step into the Octagon together on Oct. 27. Oezdemir, who is appropriately nicknamed “No Time,” earned a pair of blistering knockouts over Jimi Manuwa and Misha Cirkunov en route to a light heavyweight title shot earlier this year. Meanwhile, Smith has gone 2-0 since moving to 205 pounds with back-to-back knockouts against former champions Mauricio "Shogun" Rua and Rashad Evans. Oezdemir and Smith definitely don't like to get paid by the hour, so it’s awfully tough to see how this highly anticipated main event makes it past the first round, much less to the judges' scorecards on Saturday night. Former lightweight contender turned featherweight Michael Johnson stepped up on less than two weeks’ notice for this co-main event slot against the always tough Artem Lobov. Johnson has put together a pair of strong performances since moving to 145 pounds and he's coming off an impressive win over Andre Fili in his last bout. Lobov has never backed down from a challenge and this fight will surely be no different. The former Ultimate Fighter finalist is known for his huge power and unbelievable durability. That's a combination for a potential Fight of the Night when he mixes it up with Johnson this weekend. It wasn't long ago that Misha Cirkunov was considered the best prospect in the light heavyweight division. He's endured a couple of tough losses in his most recent performances, but now he's back to reclaim a spot in the top 10 rankings while going up against tough-as-nails wrestler Patrick Cummins in Moncton. Cummins and Cirkunov are both known for high-output offense, so it will be interesting to see what happens when these two bulls collide. Coming off a heartbreaking loss in a Fight of the Night performance against Sean O'Malley in March, Andre Soukhamthath will attempt to get back on track when he faces UFC newcomer Jonathan Martinez, who comes in with a 9-1 record. Martinez is a very solid prospect, with his only loss coming from a disqualification due to an illegal strike, and he's earned seven finishes by knockout or submission in his nine professional wins. 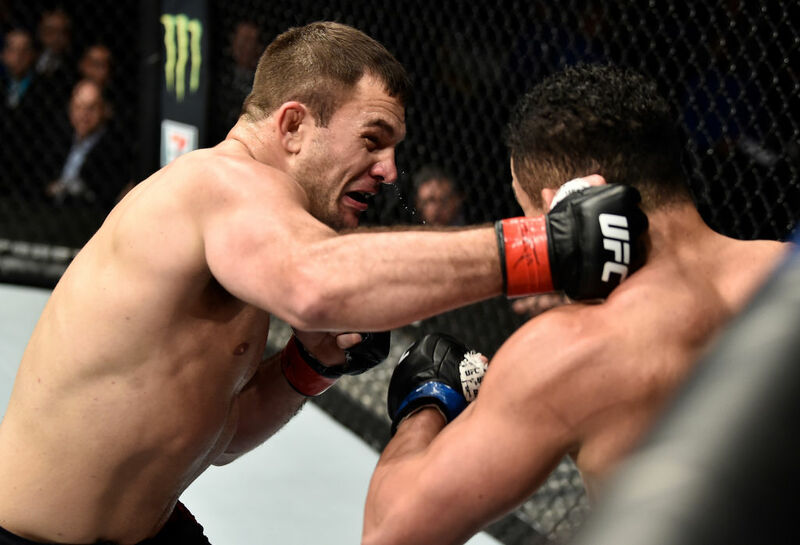 Gian Villante doesn't understand the meaning of a boring fight, which is why he's consistently put in these kinds of high-profile situations on the main card. The New York native has racked up three Fight of the Night awards as part of the UFC roster and he'll surely look for another bonus when he returns on Saturday night. As for his opponent, Ed Herman will come into this fight off two straight losses, which means he's going to do anything and everything it takes to stave off that third consecutive defeat while clashing with Villante. Powerhouse welterweight Alex Garcia has bounced back and forth between wins and losses over his past eight fights, which means he's due for a victory after falling to Ryan LaFlare in his last performance. To get the job done, Garcia has to go through former Ultimate Fighter winner Court McGee, who is coming back from two consecutive losses of his own and he'll look to rebound when he opens the main card from Moncton. Canadian favorite Nordine Taleb will fight in his home country for the fifth time in his UFC career when he takes on Sean Strickland in a welterweight match as the featured prelim on FS1. Both fighters have gone 2-2 over their last four fights, with Taleb and Strickland coming off losses in their most recent outings. With an incredibly stacked division in front of them, a win on Saturday night is paramount for both fighters. Thibault Gouti has faced some tough competition since joining the UFC roster, which probably explains his 1-4 record in the Octagon. Still, Gouti has to know that he needs to get the job done this weekend, but things don't get any easier as he faces Nasrat Haqparast, who will look for his second win in a row after defeating Marc Diakiese in his most recent fight. Calvin Kattar will look to get back in the win column this weekend after suffering the first loss of his UFC career in his last fight against top 10-ranked featherweight contender Renato Moicano. To get the victory, Kattar will have to go through UFC newcomer Chris Fishgold, who comes in with an impressive 17-1 record that includes seven wins in a row. Canadian fighter Sarah Moras has built a reputation on her toughness and never-say-die attitude whenever she competes, but bouncing back and forth between wins and losses has left her with a 2-2 record in the UFC. Meanwhile, Bernardo has yet to taste victory under the UFC banner and she has to know this is a must win situation going up against Moras. Following a stunning 28-second knockout to earn his UFC contract on Dana White's Tuesday Night Contender Series, Te Edwards will make his official Octagon debut this weekend. He faces fellow UFC rookie Don Madge, who comes into the fight off four straight wins, including three first-round finishes during that stretch. Arjan Singh Bhullar and Marcelo Golm are each coming off the first losses of their respective careers, so it will be interesting to see how they bounce back from defeat. Considering this is a heavyweight matchup, expect heavy leather to fly early and often when Bhullar and Golm meet in the middle of the Octagon in Moncton. Scottish fighter Stevie Ray has suffered back-to-back losses in his most recent fights and there's no chance he wants to add a third. To get a win this weekend, he'll have to go through Jessin Ayari, who will be making his first appearance in the UFC since May 2017, when he took former welterweight title challenger Darren Till to a three-round decision.